With its opening on 11.11.11, the numbers aligned this weekend for “Immortals,” the highly stylized, sword-and-slash ancient action epic from director Tarsem Singh, as it won the box office with $32 million. The muscular mythological movie attracted a young, male audience to the multiplex. Three-quarters of its viewers were under age 35 and 60 percent were male, The Hollywood Reporter said. Their turnout allowed “Immortals” to defeat the new Adam Sandler comedy “Jack and Jill,” which was second with $26 million, and to end the reign of “Puss in Boots,” which dropped to third with $25.5 million. But the film’s performance was not one for the ages compared with genre predecessors “300” and “Clash of the Titans,” which generated $70.8 million and $61.2 million, respectively, in their debuts. He is the president of distribution for Relativity, and “Immortals” is its top opening since it began distributing movies, The Hollywood Reporter noted. The 3D flick cost about $75 million to make. 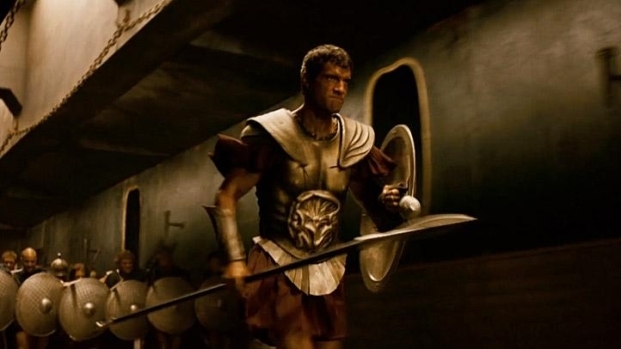 “Immortals” – which stars Theseus (Henry Cavill), the villainous King Hyperion (Mickey Rourke) and Zeus (Luke Evans) in a war from Greek myth – also took in $36 million abroad. Look-Up in the "Immortals" Trailer! It's a Bird! It's a Plane! It's Henry Cavill! Henry Cavill stars in this mythological epic opening Nov. 11. “Jack and Jill” represents a worse-than-usual opening for Sandler, even if it set an obscure record by garnering $2.5 million in Mexico. Right behind it was “Puss in Boots,” the first movie showcasing the brash, sometimes grumpy, but inevitably charming 2-foot-tall Spanish cat voiced by Antonio Banderas. The animated movie from DreamWorks held strong, declining just 23 percent from the $33 million it grossed last weekend, but nevertheless Puss, or “Frisky Two Times,” ceded the throne after an unexpected two-week run at the top. Clint Eastwood’s latest film, “J. Edgar,” opened at No. 5 with $11.5 million, and distributor Warner Bros. was confident that it would play well through Thanksgiving. Overall, the top 10 was up 18 percent over the same weekend in 2010, EW.com reported. Still hanging around in the last spot: Hugh Jackman’s “Real Steel,” which took in $2 million, to push its total to $81.7 million.